D. H. Lawrence ‘The misunderstood Genius’ reminds me of children with specific learning difficulties. As a lecturer in English Language and Literature I was so immersed in that world, contentment knew no bounds. I would prepare hard for each lecture and would pour my heart into the attempts to touch my students and rouse in them the same zeal and passion for these subjects as I was. As always life moved on and personal priorities took over professional pursuits. Time rolled on….and life presented an opportunity where I could pause and take an objective assessment of where I wanted to be. Soon found myself in the world of special education. As special educator for children with specific learning difficulty has been a short journey with long lasting experience. I felt a sense of achievement when a child in the mainstream could interpret a literary piece differently. Now although the child cannot put it on paper it is a sense of fulfilment when a child with specific learning difficulty is also able to interpret differently. 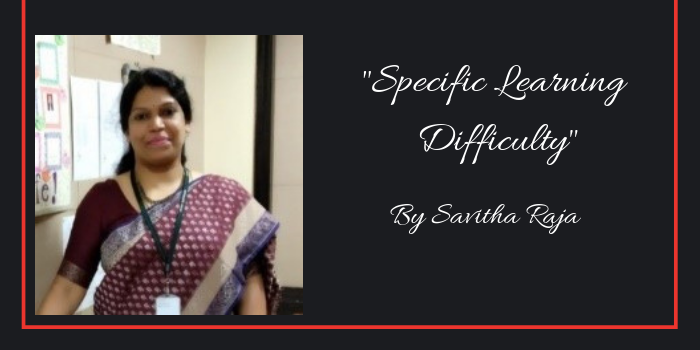 As a special educator, have walked some ways with the children in understanding their specific learning difficulties. Bethany High School fosters a happy environment for learning and enriching students with varied learning issues. They are children with average or above average IQ, who are neither ‘lazy’ nor ‘disinterested’. And with complaints such as illegible handwriting, poor spelling, unable to copy from the black board, limited vocabulary, unable to read due to inefficient visual memory, difficulty pronouncing words leading to poor comprehension. Our students require more individualised and intense remedial programme. Among other skills, what I personally found challenging was to make them understand that writing is also a form of communication and unless they write, another has no window to their thinking. Their writing becomes so restricted and hence it is difficult to appreciate their ideas and thoughts. The fear of incorrect spellings limits their expression, due to deficits in recall, retention or phonological processing.As an educator we ought to encourage writing with ample practice and instil confidence in them and look at ‘writing’ as a way of self-expression. Yet another challenge that I have come across has been in the area of ‘following instructions’. It was often intriguing how they couldn’t understand or follow simple instructions. The difficulty lies in their short-working memory capacity and slow processing speed. Instruction could be tailored to the child’s specific needs and eye contact should be made along with explicit instruction are some of the ways. I am at this juncture where I am truly motivated to make that ‘leap’ and value those small but significant changes in them and for myself. It’s a revelation/self-revival. From measuring success in terms of marks and grades to achieving reading, comprehension, spelling and writing skills is an important milestone in my journey with them. Am grateful to Bethany for giving me this opportunity and allowed me grow from within. The school has taken greater responsibility in providing support services and well-structured learning environment towards inclusiveness. It should be every special educator’s goal to imbue confidence in them to brave society and lead an inclusive life.